The light of the world. The light of life. Jesus Christ. The Bible is a story about light overcoming darkness, life overcoming death, love overcoming fear. The Bible is a story about Jesus, the Son of God, who is both fully human and fully divine. For many of us the creation story is familiar, but sometimes, when we take another look, God will reveal fresh truths to our heart. Take a few moments to revisit the creation story in Genesis 1. This story is more than the creation of the world; in it we can also see our own creation story as we are new creations in Christ. Just as the earth was “formless and empty” before God spoke the world into being I, too, was “formless and empty” before Jesus, “the Word made flesh” spoke into me. Darkness covered the surface of my heart. I was drowning in my own sin and in the darkness of the world but, … the Spirit of God was hovering. After half a lifetime spent trying to form and fill myself, when I finally stopped striving and started to surrender, for the first time I saw myself as I truly was - formless and empty. And when I asked Jesus to come fill me, He did. 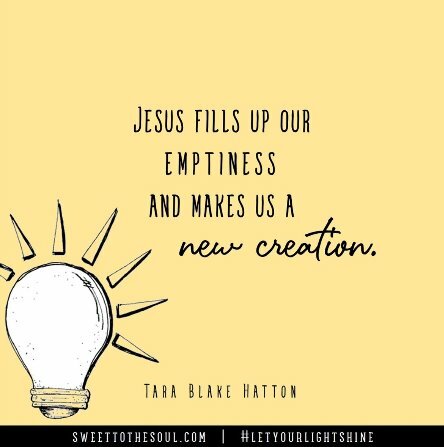 I was filled by Jesus, the light of life, and I became a new creation in Him. He brings us from dark to light, from death to life. God sees the light of Jesus in us and He sees the light is good. He sees us as good, not because of anything we ever will or ever could do but because we are covered by the blood of Jesus. 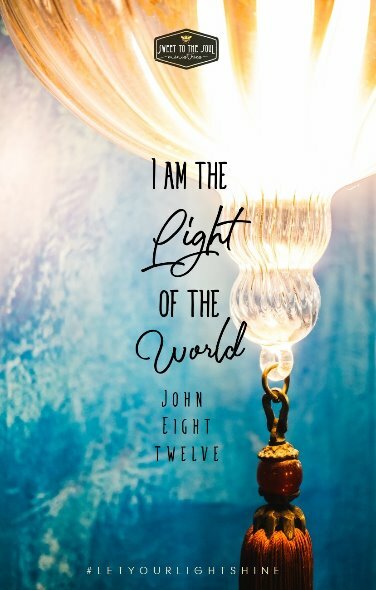 It is His light burning brightly within us. So, as the song says, we let our little lights shine. 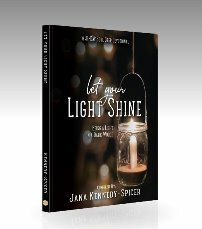 And then, as we shine our little lights for His glory, He continues His creative work in us. He continues to form and fill, to gather and separate. He begins to separate the light from the darkness within our souls. He illuminates and He reveals and He uncovers hurt and pain we have long ignored and avoided. Jesus takes us by the hand and walks with us into our own broken darkness. He walks with you, shines His light into the depths of your spirit to reveal sin and shame, pain and hurt. But He doesn’t expose the hard places only to leave you there; gaping open, bleeding and raw. He brings your darkness out into His light so He can heal and restore and make your broken-ness whole. And complete. In Him. That’s Jesus. The light of the world. The light of life. Father God, I thank you that I am your creation, your masterpiece. I thank you that I was chosen in you before the creation of the world. I thank you that you continue Your creative work in me, to form and to fill my soul, to gather and to separate the light and the darkness within me. God, I thank you that You search my heart and you know what is within better than I do. God, please continue to search me, to know me, and to show me. “Create in me a pure heart, O God, and renew a steadfast spirit within me.” From the heavens to the depths, from the wings of the dawn to the far side of the sea, there is nowhere I can escape your love; you have promised to guide me, to hold me in your hand. I thank you, God, for sending Your Son Jesus who came “into the world as a light, so that no one who believes should stay in darkness.” Thank you for Your great love, a love so great that you sent Your Own Son to rescue me from the darkness. And thank You for Your Word to guide me, to be “a lamp for my feet and a light for my path.” God, please give me the courage to follow You into my own heart and to trust that Your work within me is good. In Jesus’ name, Amen.